Duplicate files make searching through files on your hard drive a confusing task, increase clutter and disorganization, and take up disk space that could be used for other purposes. 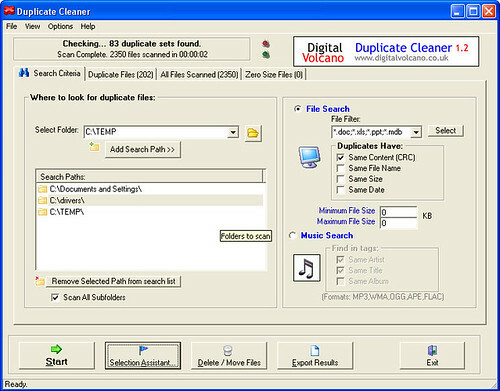 Duplicate Cleaner helps you locate and delete duplicate files on your PC. It comes with many flexible search parameters so you can customize searches for certain file types, for files with the same size, name, or date, or that have a minimum or maximum file size. For those with a large music collection, you can use the program to search in the metadata of MP3, WMA, and OGG music files for files with the same artist, title, or album. This is a big help if you haven't been too discriminating in downloading music online.